DIRECTIONS : Wash hair and towel dry. Apply with massages. Leave on from 2 to 3 minutes depending on the condition of the hair. SIZE : Net Wt. 8 oz / 225 g.
Prevents hair breakage and split ends. Vitamins A, E, "F", H (Biotin), H', Pro-Vitamina B5 (Panthenol), H8 (Inositol) and Horse Chestnut Extract improve the health and beauty of the hair, helping it to grow longer. Prevents hair breakage and split ends. Contains vitamins A, E, F, H (Biotin), H Pro-Vitamin B5 (Panthenol), H8 (Inositol) and Horse Chestnut Extract improve the health and beauty of the hair, helping it to grow longer. DIRECTIONS : Wash hair and towel dry. Apply with massages. Leave on from 2 to 3 minutes depending on the condition of the hair. SIZE : Net Wt. Silicon Mix Intensive Shampoo16oz&Treatment16oz&Leave-in8oz&Polisher4oz "SET"
Silicon Mix Intensive Shampoo 16 oz. Intensive Leave-in Hair Shine and Conditioner 8 oz. Hair Shine and Conditioner. Works in the internal and external hair structure from roots to ends. Protects against the sun, salted and bleached water and chemical processes. Directions: Can be used on wet or dry hair. It contains 8 oz and provide an intense nutrition to your hair. the product contain Bamboo extract, a natural product that regenerates an nourishes your hair. 100% authentic, fresh & new. 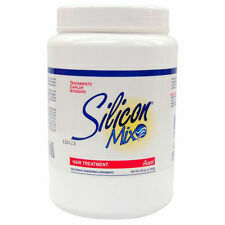 Silicon MIX Intensive Hair Deep Treatment 60 Oz "Pack of 2"
DIRECTIONS : Wash hair and towel dry. Apply with massages. Leave on from 2 to 3 minutes depending on the condition of the hair. SIZE : Net Wt. 60 oz / 1,700 g each. Add favorite. 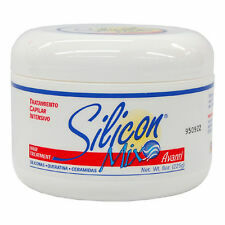 Silicon Mix Hair Treatment 8 oz / 225 g with "Free Gift"
SIZE : Net Wt. DIRECTIONS : Wash hair and towel dry. Apply with massages. Leave on from 2 to 3 minutes depending on the condition of the hair. Add favorite. 4.5 out of 5 stars - Silicon Mix Hair Treatment 8 oz / 225 g with "Free Gift"
37 product ratings37 product ratings - Silicon Mix Hair Treatment 8 oz / 225 g with "Free Gift"
Silicon Mix Bambu Bamboo Nutritive Hair Treatment Net Wt. 60 Oz. "Pack of 2"
DIRECTIONS : Wash hair and towel dry. Apply with massages. Leave on from 2 to 3 minutes depending on the condition of the hair. SIZE : Net Wt. Add favorite. Use Bambu Nutritive Leave-in Conditioner to comb your hair. Contains Bamboo Extract, a natural product to regenerate and nourish the hair and Silicones to smooth and give shine. Prevents hair breakage and split ends. 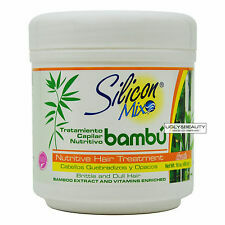 Silicon Mix Bambu Bamboo Nutritive Leave-In Conditioner 8 fl. oz. "Pack of 2"
Use Bambu Nutritive Leave-in Conditioner to comb your hair. Contians Bamboo Extract, a natural product to regenerate and nourish the hair and Silicones to smooth and give shine. Prevents hair breakage and split ends. Directions: Apply a small amount into palm of hands and spread evenly to surface of hair. Can be applied to damp or dry hair. Add favorite. Size: 4 fl. Penetrates the hair shaft stimulating hair growth and elasticity. 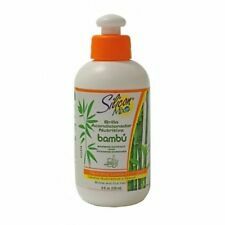 Silicon Mix Bambu Shampoo 16oz,Leave-in 8oz,Treatment 16oz,Polishe 4oz "SET"
The silicon mix bambu leave-in is a product imported from Dominican Republic. The Bambu nutritive leave-in conditioner is used to comb your hair cause it contains bambu extract that brings shine and softness to your hair and it avoids dull hair. Contains Pearl Extract, a natural marine product that rejuvenates and fortifies the hair and Lustre Finish to create lustrous and healthy looking hair and repel humidity, avoiding Frizz. Directions: Wash hair and apply with massages. Silicon MIX Moisturizing Shampoo 16 fl. oz. "Pack of 2"
2 bottles of Silicon Mix Shampoo Hidratante 16 fl. Directions: Apply to damp hair and lather. Rinse thouroghly. Repeat if necessary. Add favorite. 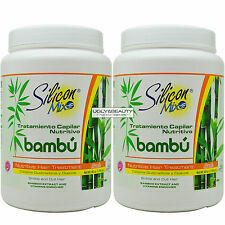 Silicon Mix Bambu Bamboo Nutritive Shampoo 16 fl. oz. "Pack of 3"
Bambu Nutritive Shampoo contains Bamboo Extract a natural product to regenerate and nourish the hair and Silicones to smooth and give shine. Prevents hair breakage and split ends. Vitamins A, E, "F", H (Biotin), H', Pro-Vitamina B5 (Panthenol), H8 (Inositol) and Horse Chestnut Extract improve the health and beauty of the hair, helping it to grow longer. The Bambu nutritive leave-in conditioner is used to comb your hair cause it contains bambu extract that brings shine and softness to your hair and it avoids dull hair. SILICON MIX NUTRITIVO BAMBO Silicon Mix Bambu Nutritive Shampoo Extract and Vitamins Enriched Brittle Dull Hair Contains Bamboo Extract, a natural product to regenerate and nourish the hair and Silicones to smooth and give shine. Natural product to regenerate and nourish the hair and silicones to smooth and give shine. vitamins A, E, F, H (Biotin), H Pro-Vitamin B5 (Panthenol), H8 (Inositol) and Horse Chestnut Extract improve the health and beauty of the hair, helping it to grow longer. This product is suitable for all hair types. Silicon Mix Moroccan Argan Oil Leave-in 8-ounce Conditioner. Contains Moroccan Argan oil, vitamin E, keratin, and macadamia oil to help smooth hair. Leave-in hair conditioner for all hair types. 1xSilicon Mix Moroccan Argan Oil Hair Polisher 4 oz. Silicon Mix Moroccan Argan Oil Hair Polisher 4 oz. 1xSilicon Mix Moroccan Argan Oil Shampoo 16 oz. Silicon Mix Moroccan Argan Oil Shampoo 16 oz. 1xSilicon Mix Moroccan Argan Oil Leave-in Conditioner 8 oz. Directions: Apply to damp hair and lather. Rinse thouroghly. Repeat if necessary. Add favorite. Silicon Mix Intensive Leave-in Hair Conditioner 8 oz "Pack of 2"
2 bottles of Silicon Mix Intensive Leave-in 8 fl. Works in the internal and external hair structure from roots to ends. Protects against the sun, salted and bleached water and chemical processes. Directions: Can be used on wet or dry hair. Protect hair from sun wind salt water chlorine and chemical process. DIRECTIONS : Wash hair and towel dry. Apply with massages. Silicon Mix Bambu Nutritive Hair Treatment 36 oz "Pack of 2"
Contains BAMBOO EXTRACT, a natural product to regenerate and nourish the hair and silicones to smooth and give shine. Silicon mix intensive leave in hair shine and conditioner (4oz). LEAVE IN HAIR CONDITIONER SET. Silicon Mix Proteina De Perla Leave-In Conditioner contains in its formula Silicons, Keratin, Ceramide and Silk Protein to revitalize and soften the hair. Contains Pearl Extract, a natural marine product to fortify the hair and Lustre Finish to avoid frizz. Silicon MIX Moisturizing Shampoo 16 fl. oz. 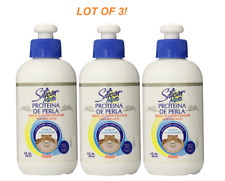 "Pack of 3"
3 bottles of Silicon Mix Shampoo Hidratante 16 fl. Directions: Apply to damp hair and lather. Rinse thouroghly. Repeat if necessary. Add favorite. 5 out of 5 stars - Silicon MIX Moisturizing Shampoo 16 fl. oz. "Pack of 3"
1 product rating1 product ratings - Silicon MIX Moisturizing Shampoo 16 fl. oz. "Pack of 3"
SIZE : 473 ml / 16 fl oz. DIRECTIONS : Wash hair and towel dry. Apply with massages. Leave on from 2 to 3 minutes depending on the condition of the hair. SIZE : Net Wt. Silicon Mix Intensive Gift Set (W/Tote Bag). 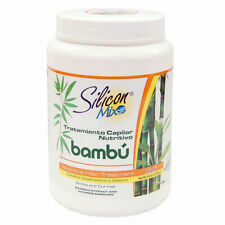 Silicon Mix Shampoo Nutritivo Bambu 16 oz BAMBOO EXTRACT AND VITAMIN ENRICHED. 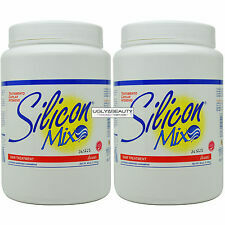 silicon mix treatment 60oz " 6 pack"